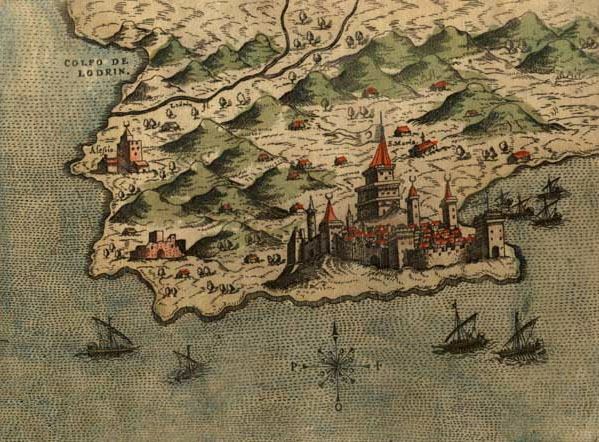 Durrës ([ˈdurəs]), historically also known as Epidamnos, Durazzo ([duˈrattso]) and Dyrrachium, is the largest port and second largest city and a municipality of Albania. Founded by Greek colonists from Corinth and Corfu as Epidamnos in 627 BC, it has been continuously inhabited ever since and is one of the oldest cities in Albania. Geographically, it is central on the coast, about 33 km (21 mi) west of the capital Tirana. It is one of the most ancient and economically significant cities of Albania. Durrës is home to Albania's main port, the Port of Durrës. The city is at one of the narrower points of the Adriatic Sea, opposite the Italian ports of Bari and Brindisi. The port is also the 10th largest cargo port on the Adriatic Sea that handle more than 3.4 million tonnes of cargo per year. The city of Durrës is home of one of the largest amphitheatres in the Balkan peninsula, the Durrës Amphitheatre once having a capacity of 20,000 people. 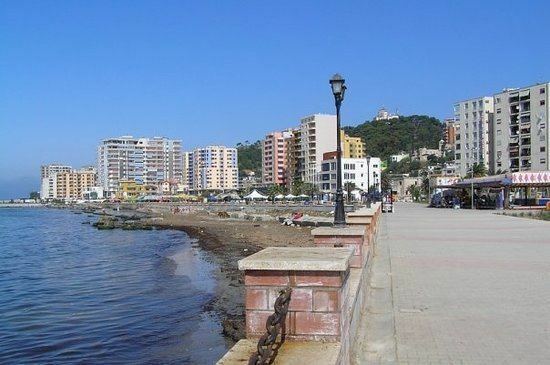 Durrës is one of largest cities on the Adriatic Sea and ranks 5th with a population of 175,110. The total population is 175,110 (2011 census), in a total area of 338.30 km2. The population of the former municipality at the 2011 census was 113,249. The metropolitan area has a population of 265,330. In the 4th century, Dyrrachium was made the capital of the Roman province of Epirus nova. It was the birthplace of the emperor Anastasius I in c. 430. Some time later that century, Dyrrachium was struck by a powerful earthquake which destroyed the city's defences. Anastasius I rebuilt and strengthened the city walls, thus creating the strongest fortifications in the western Balkans. The 12-metre-high (39-foot) walls were so thick that, according to the Byzantine historian Anna Komnene, four horsemen could ride abreast on them. Significant portions of the ancient city defences still remain, although they have been much reduced over the centuries. Durrës became a Christian city quite early on; its bishopric was created around 58 and was raised to the status of an archbishopric in 449. It was also the seat of a Greek Orthodox metropolitan bishop. Under Turkish rule, many of its inhabitants converted to Islam and many mosques were erected. This city was renamed as Dıraç but did not prosper under the Ottomans and its importance declined greatly. By the mid-19th century, its population was said to have been only about 1,000 people living in some 200 households. Its decrepitude was noted by foreign observers in the early 20th century: "The walls are dilapidated; plane-trees grow on the gigantic ruins of its old Byzantine citadel; and its harbour, once equally commodious and safe, is gradually becoming silted up." It was a main centre in İşkodra Vilayet before 1912. During the First World War, the city was occupied by Italy in 1915 and by Austria-Hungary in 1916–1918. It was captured by the Allies in October 1918. Restored to Albanian sovereignty, Durrës became the country's temporary capital between 1918 and March 1920. It experienced an economic boom due to Italian investments and developed into a major seaport under the rule of King Zog, with a modern harbour being constructed in 1927. An earthquake in 1926 damaged some of the city and the rebuilding that followed gave the city its more modern appearance. During the 1930s, the Bank of Athens had a branch in the city. The Second World War saw Durrës (called Durazzo again in Italian) and the rest of Albania being annexed to the Kingdom of Italy between 1939–1943, then occupied by Nazi Germany until 1944. Durrës's strategic value as a seaport made it a high-profile military target for both sides. It was the site of the initial Italian landings on 7 April 1939 (and was fiercely defended by Mujo Ulqinaku) as well as the launch point for the ill-fated Italian invasion of Greece. The city was heavily damaged by Allied bombing during the war and the port installations were blown up by the retreating Germans in 1944. The Communist regime of Enver Hoxha rapidly rebuilt the city following the war, establishing a variety of heavy industries in the area and expanding the port. It became the terminus of Albania's first railway, begun in 1947. In the late 1980s, the city was briefly renamed Durrës-Enver Hoxha. The city was and continues to remain the center of Albanian mass beach tourism. Following the collapse of communist rule in 1990, Durrës became the focus of mass emigrations from Albania with ships being hijacked in the harbour and sailed at gunpoint to Italy. In one month alone, August 1991, over 20,000 people migrated to Italy in this fashion. Italy intervened militarily, putting the port area under its control, and the city became the center of the European Community's "Operation Pelican", a food-aid program. In 1997, Albania slid into anarchy following the collapse of a massive pyramid scheme which devastated the national economy. An Italian-led peacekeeping force was controversially deployed to Durrës and other Albanian cities to restore order, although there were widespread suggestions that the real purpose of "Operation Alba" was to prevent economic refugees continuing to use Albania's ports as a route to migrate to Italy. Durrës is the second largest city and a municipality of Albania. It is central on the coast, about 33 kilometres (21 miles) west of the capital Tirana. The city is at one of the narrower points of the Adriatic Sea, opposite the Italian ports of Bari and Brindisi. Durrës is located 41.32 latitude and 19.44 longitude and it is situated at an elevation of 13 metres (43 feet) above sea level. The southern part of the coastal plain is characterized by a relatively dry Mediterranean climate, hot summers with an average temperature of 26 °C (79 °F). Winter is mild and wet with an average temperature of 9.8 °C (49.6 °F). The average annual rainfall amounts to 800 to 1,300 mm (31.5 to 51.2 inches), but only 12 percent of the total falls in the period June–September. In this area many crops are grown (cereals, industrial crops, vegetables, forages etc. ), also citrus and olive trees. According to data from the National Census in 2011, the Urban areas of Durrës include 201,110 people. Albania is one of the most ancient countries of Christianity. There are thought to have been about seventy Christian families in the port town of Durrës as early as the time of the Apostles. The archbishopric of Durrës having been founded by the apostle Paul while preaching in Illyria and Epirus. The Orthodox Church of Albania, which has been autocephalous since 1923 was divided into the archbishopric of Tirana – Durrës, headed by the Metropolitan and sub-divided into the local church districts of Tirana, Durrës, Shkodër and Elbasan. When it comes to religion, Muslims (including the large Bektashi minority in Albania) and Christians make up the majority of Durrë's population. According to the World Bank, Durrës has made significant steps of starting a business in 2016. Durrës ranks 9 among 22 cities in Southeastern Europe before the capital Tirana, Belgrade, Serbia and Sarajevo, Bosnia and Herzegovina. The rail station of Durrës is connected to other cities in Albania including Vlorë and the capital of Tirana. The Durrës–Tiranë railway was a 38-kilometre (24-mile) railway line which joined the two biggest cities in Albania: Durrës and Tiranë. The line connects to the Shkodër–Vorë railway halfway in Vorë, and to the Durrës-Vlorë railway in Durrës. In 2015, some rail stations and rolling stock along the Durrës-Tiranë line are being upgraded and latter colored red and white. In October 2016 they will start building a new Railway with the cost of 81,5 million Euros. And it is expected that it will be used around 1,4 million times a year. Durrës is home to the largest archaeological museum in the country. There are also several museums such as Royal Villa of Durrës and the Museum of History (the house of Aleksandër Moisiu). Durrës host also the Aleksandër Moisiu Theatre, the Estrada Theater, the puppet theater, and the philharmonic orchestra. 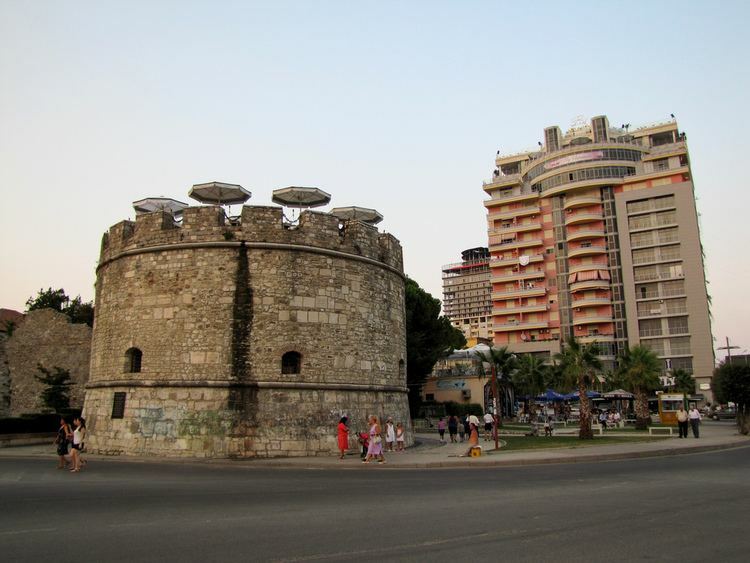 The city hosts the Durrës Ancient City Wall called also Durrës Castle while the largest amphitheatre in the Balkans is in the city close to the harbour. This first-century construction is currently under consideration for inscription as a UNESCO World Heritage site. Durrës hosts the International Film Summerfest of Durrës, it has since takes place every year in late August or early September in Durrës Amphitheatre. In 2004 and 2009 Miss Globe International was held in Durrës. It is home to different architectural styles that represent influential periods in its history. The architecture is influenced by Illyrian, Greek, Roman and Italian architecture. In the 21th century, Durrës has turned into a proper modernist city, with large blocks of flats, modern new buildings, new shopping centres and many green spaces. Durrës host the largest archaeological museum in the country, the Durrës Archaeological Museum. The museum is located near the beach and north of the museum are the 6th-century Byzantine walls, constructed after the Visigoth invasion of 481. The bulk of the museum consists of artifacts found in the nearby ancient site of Dyrrhachium and includes an extensive collection from the Illyrian, Ancient Greek, Hellenistic and Roman periods. 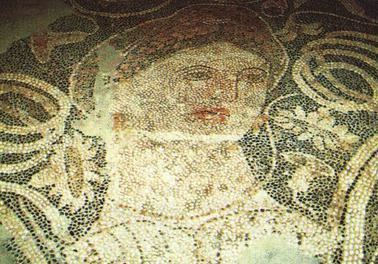 Items of major note include Roman funeral steles and stone sarcophagi, an elliptical colourful mosaic measuring 17 by 10 feet, referred to as The Beauty of Durrës, and a collection of miniature busts of Venus, testament to the time when Durrës was a centre of worship of the goddess.